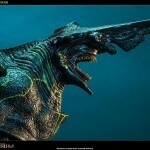 Some new images from NECA’s next “Pacific Rim” release have come online! This is the Category III Kaiju codenamed “Knifehead” updated in a larger scale and with new battle damage detail. 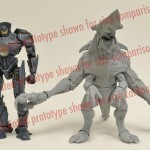 The upsizing brings Knifehead much closer in size to the already-released Jaeger figures. 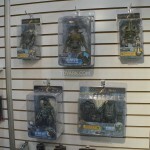 Knifehead Version 2 has an expected release window of first-quarter 2014 and these in-package pictures suggest that retailers will have this wave in stock very soon. 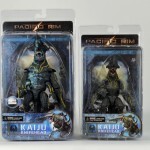 NECA‘s Pacific Rim Gipsy Danger and Knifehead 2-Pack is hitting store shelves this week. Check out some info below and read on for the photos of each release. 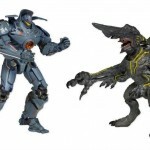 A new pre-order at BigBadToyStore has revealed a new Pacific Rim 2 Pack, Gipsy Danger VS Knifehead! After the movie premiered, some of you have mentioned difficulty in finding the figures at Toys R Us. Both figures were in wave 1, so if you missed out, this set can aid in catching up. We aren’t sure if these will be repainted or come with additional accessories, so stay tuned! Price is $35.99 and this set is scheduled for release in October. 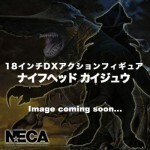 Thanks to our sister site the Toyark for the heads up that NECA will be releasing the 18″ Knifehead figure for its Pacific Rim toyline! 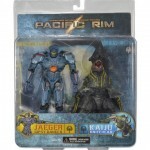 This long awaited figure is the 2nd figure to come in the 18″ Pacific Rim series and the 1st Kaiju in this scale! Confirmation comes our way via a preorder by AmiAmi. Read on to see the teaser image! 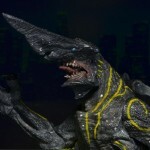 Sideshow Collectables has announced that a high end statue of the Kaiju Knifehead from Pacific Rim will see a release in April 2014. Every detail of the monster is recreated in exquisite detail, but the statue will cost a heavy 379.99$ US.